A true royal palace, however, from the age of the divine right of kings, had its own smaller "court theater" in the palace, itself, called a teatro di corte in Italian. The best-known teatro di corte in Bourbon Italy was no doubt the one built by Vanvitelli into the great palace of Caserta. It, however, was fashioned on the one within the royal palace in Naples. This teatro di corte is among the least-known attractions in the city, one, because it is overshadowed by the sumptuous San Carlo, and, two, because you actually have to go into the royal palace, itself, to find it. There was, no doubt, an original teatro di corte in the first royal palace built on the site, in the year 1600. The one you see today, however, is from 1768 and was designed by Ferdinando Fuga, one of the great names of Italian architecture in the 1700s. It is also called the Gran Sala or the Sala Regia (royal hall). 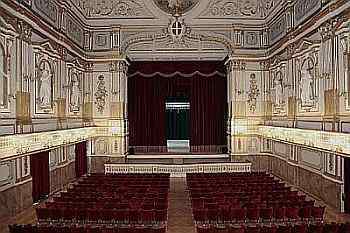 It was a venue for many of the Neapolitan comic operas of the 18th century, although with the passage of time the main theater of San Carlo accommodated those works, as well, in addition to the traditional fare of opera seria. The teatro di corte was badly damaged in WWII but was restored by 1954. The original design by Fuga was adhered to; the original ceiling frescoes by Antonio Dominici and Crescenzo La Gamba were faithfully restored, as was a precious series of 12 statues by Angelo Viva, depicting characters from Greek mythology. *Name in art of Angelo Carasale!